In what has emerged as a company defining development, Pacifico Minerals Ltd (ASX:PMY) has completed an updated prefeasibility study (PFS) for its Sorby Hills Project, demonstrating that a high quality, high margin base metals project can be established. 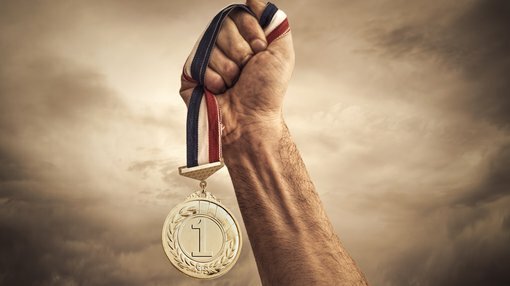 This is a significant development for the project which is strategically positioned near essential infrastructure in Western Australia, particularly given that mining leases and key permits have already been granted, placing the company in a strong position to move quickly to the development stage. The impressive PFS combined with the company’s relatively advanced readiness no doubt contributed to the 40% share price increase that occurred on Tuesday morning. 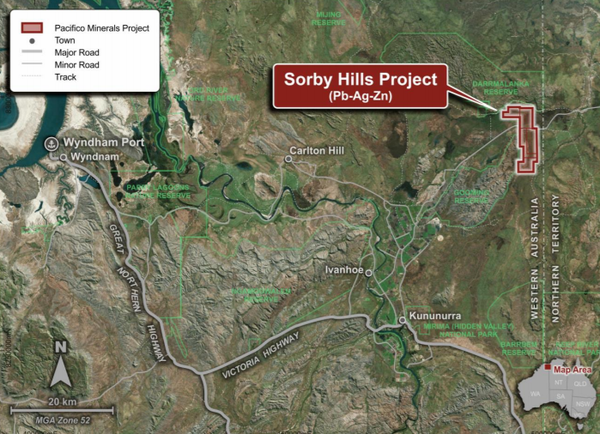 Commenting on the PFS and upcoming initiatives, managing director Simon Noon said, “Following a substantial upgrade to the Mineral Resource Estimate in early March 2019, the economic outcomes of this study are compelling and represent an important milestone towards the development of Sorby Hills. Consequently, 2019 is shaping up as a watershed year for the company with multiple share price catalysts including a mineral resource upgrade, a PFS with even better commercial outcomes and a DFS that will put a finer point on the metrics and timelines surrounding the transition to production. During this period the company will continue its exploration campaign with 6500 metres of drilling planned to start in April/May, another potential share price catalyst. Management is already in discussions regarding project financing which could include basic debt funding from a financial institution or strategic financing, which could involve offtake agreements or an extension of its joint venture partner’s stake. As things currently stand, Pacifico owns 75% of the project and Yuguang (Australia) Pty Ltd, a subsidiary of Henan Yuguang, owns the remaining 25%. HYG is the largest lead smelting company and silver producer in China and has been among the Top 500 Chinese enterprises and Top 500 China manufacturing enterprises for the past five consecutive years. The PFS proposes an open-pit operation and a 1 million tonne per annum plant that applies conventional flotation processing. Product will be transported along an existing sealed road to the Port of Wyndham, which is located approximately 150 kilometres from the proposed mine site. Feed to the mill for the proposed 8 year mine life is comprised of 8.6 million tonnes of Indicated Mineral Resources. It is important to note that the tonnage volumes incorporated in the PFS don’t include Inferred Resources which currently stand at 19.1 million tonnes, indicating that their potential inclusion has the capacity to take the mine life beyond 20 years and/or be used to develop a higher throughput operation. As indicated below, the PFS points to steady state annual production of concentrate containing approximately 31,000 tonnes per annum of lead and 1.2 million ounces per annum of silver. 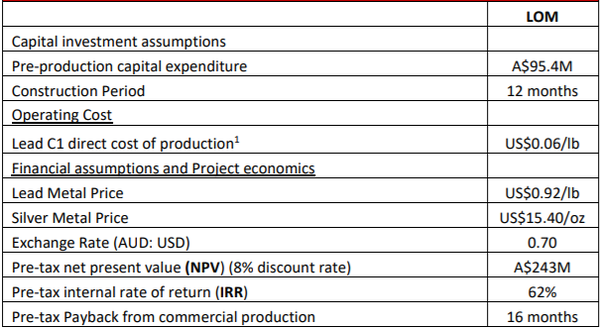 Pre-production capital expenditure is estimated to be $95.4 million and lead direct cash costs of production of US$0.06/lb, inclusive of silver by-product credits. Using a lead price of US$0.92 per pound and a silver price of US$15.40 per ounce, together with an exchange rate of $1.00/US$0.70, results in an estimated NPV (net present value) of $243 million (at an 8% discount rate) and an IRR (pre-tax internal rate of return) of 62%. These are compelling metrics for any project, but particularly attractive for a company with a market capitalisation of $9 million.